The significance of 1926 is related to a landmark 3-½ year study that was initiated in 1960 at The University of Chicago Booth School of Business (formerly Chicago GSB). For the past 50 years, CRSP has been building on and expanding the initial 35 years of data used in the Fisher Lorie Study of 1964. To a large degree, much of the research underpinning modern finance can be traced back to the vision of Jim Lorie and the focus of Lawrence Fisher who collaborated on the development of CRSP. Mutual fund companies, academic researchers, government officials and investment practitioners all use 1926 as a starting point in a variety of financial research applications. From charts to data inputs for asset allocation software, 1926 is often the start date in an historical time series. Why 1926? The significance of 1926 is related to a landmark 3-½ year study that was initiated in 1960 at The University of Chicago Booth School of Business (formerly Chicago GSB). In 1959, Louis Engel, an advertising executive at Merrill Lynch, contacted Associate Dean Jim Lorie at Chicago Booth to inquire about the availability of long term stock market return information. As the data to calculate such a return had not yet been compiled, Lorie suggested to Engel that Merrill Lynch fund the development of a database in order to calculate the return. With an initial grant of $50,000 in March 1960, the Center for Research in Security Prices (CRSP) was established. 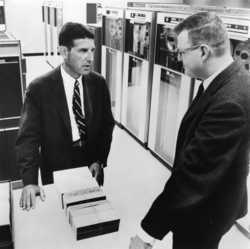 CRSP founders Professors Lawrence Fisher and Jim Lorie needed to determine a starting point before embarking on the development of the CRSP master stock database of prices, corporate actions, returns and dividends, an historic undertaking that would take until 1964 to complete. The initial date of 1926 was selected by Fisher and Lorie in order to include at least one full business cycle before the Great Depression. This date was also selected because it included 2 years of market data before the bull run of 1928-1929. For the past 50 years, CRSP has been building on and expanding the initial 35 years of data used in the Fisher Lorie Study of 1964. This year, CRSP marks its 50th anniversary and celebrates 85 years of research-quality historical market data. On November 4 and November 5, 2010, CRSP will host the CRSP Forum in Chicago, a 1-1/2 day conference where academic scholars and investment practitioners exchange research and perspectives on finance and economic topics. To learn more about the CRSP Forum, please visit http://www.crsp.com/forum; to learn more about the history of CRSP, visit http://www.crsp.com/50/. The Center for Research in Security Prices The University of Chicago Booth School of Business has been an integral part of financial and economic research since the early 1960’s. CRSP’s portfolio of stock, indexes, mutual fund, treasury, and REIT market databases is relied on by over 500 subscribers in the academic, investment practitioner and government sectors for a variety of demanding empirical research applications. Through its unique products, CRSP assists subscribers in 29 countries in achieving superior research results and making better investment decisions. To learn more about the unique data resources at CRSP, please visit http://www.crsp.com/ or contact Steven Sheehan, Director of Marketing and Subscriptions, at 312-263-6160 or at Steven(dot)Sheehan(at)crsp(dot)chicagobooth(dot)edu.